My grandmother asked me to bring almond macaroons to our recent Passover dinner. This sent me in a tailspin searching high and low around Brooklyn and the Lower East Side, but much to my dismay, the only place I found them did NOT have kosher-for-passover ones. I personally love the coconut ones, but when Grandma asks for something specific, we do not argue. How funny is it that I finally wound up finding them oh, about 10 minutes away from my house. 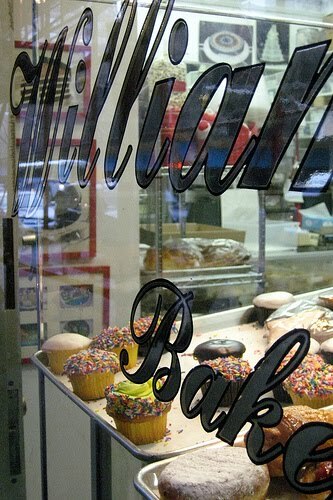 Why I didn’t check FIRST at this upper east side Jewish owned legendary bakery is beyond me. Apparently, I much prefer wild goose chases around the NYC boroughs. Anyway, (and we will just look away from the fact that they wound up costing me $28 for ONE lb of cookies) they were absolutely outstanding. Slightly chewy without actually sticking to your teeth. Deliciously and naturally flavored with almond paste. Yum yum yum. I made it a point to go back the following week to treat myself to their famous black & white cookies- which were every bit as wonderful as the reviews around here have built them up to be. It was then that I found out what I’ve been searching to discover for oh, about 3 years now. THIS is the bakery that supplies Agata & Valentina AND orwashers with the most amazing rainbow cookies/rainbow cakes I’ve ever had. I am ALWAYS on a mission to find the best ones in the world and will pretty much always buy one to try where ever I see them sold. (unless they have sprinkles on top, which automatically gets them black-listed in my book) Well, let me just start to explain why these are SO far above any others I’ve tried. In between each layer of colorful cake, there is a layer of jam- apricot and/or raspberry. The cookies are tops with thin layers of dark chocolate. So far, I have not told you why these are any different from anyone else’s….but here I go. THESE amazing rainbow cookies put an extra surprise layer of marzipan between each layer of cake and jam and OMG OMG OMG it takes them to a place that is out of this world incredible. Please go visit this awesome bakery, spend too much money on too much sugar and then send me a thank you note for making you drool. If you want, you can come running with me afterwards so that you don’t feel so guilty. That’s what I do.